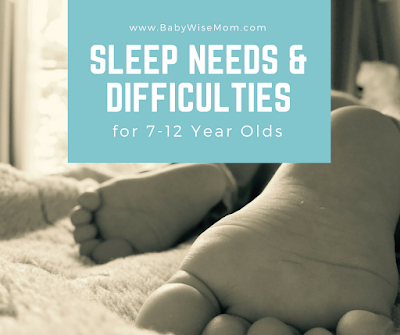 The importance of sleep does not diminish as your child grows. Your child will still have an optimal amount of sleep to get at night and will also still run into sleep problems and road blocks. If you have set up healthy sleep requirements and expectations from a young age, you will find it much easier to maintain proper sleep totals and quickly fix sleep problems that arise. This post contains affiliate links. HOW MUCH SLEEP AT NIGHT? “…the prepubertal teenager [that’s fancy for preteen, or 8-12 year old] needs nine and a half to ten hours of sleep in order to maintain optimal alertness during the day” (Healthy Sleep Habits, Happy Child , page 358). This means if your child is waking at 7:00 AM, she needs to be in bed no later than 9:30 PM. Children can vary quite a bit based on individual sleep needs, so if you find your child needs more sleep than that, be sure to have bedtime early enough. We do bedtime no later than 8-8:30 on a regular basis in our house with our three preteens. We have some nights that are later for fun occasions, but on school nights and most nights of the week, we do 8-8:30. Brayden (age 11, but almost 12) is responsible and I let him decide what time he needs to be done reading at night. He aims for 8:30-9:00. He also needs less sleep on the sleep needs scale. For Kaitlyn (age 10) and McKenna (age 8), they have a rule for lights out 8:30 PM. Have a regular and consistent bedtime. Make sure bedtime is early enough. If your child has a hard time falling asleep, try moving bedtime earlier. If your child complains about tummy pains, limb pains, and/or headaches, consider possible stress or emotional causes. It can be separation anxiety, stress, emotions, social issues, school worries, or even fear of failure. These complaints often surface around 8 years old. McKenna read Anne of Green Gables right around the time she turned 8. At the end. there is a sad death. McKenna was so worried about someone close to her dying after that. For over a month, she complained about her tummy hurting whenever bedtime approached. If you are finding your preteen aged child having common pains, get to the root of the emotional issue and help your child through it. Good sleep has a strong impact on many functions of the body, including the ability to focus and regulate everything from cravings to emotions. 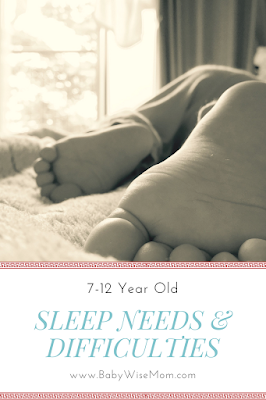 Do what you can to help even your preteens to have healthy sleep habits and skills. Healthy sleep needs do not end with little kids, and children rarely just “outgrow” poor sleep. Be intentional with your child’s sleep.